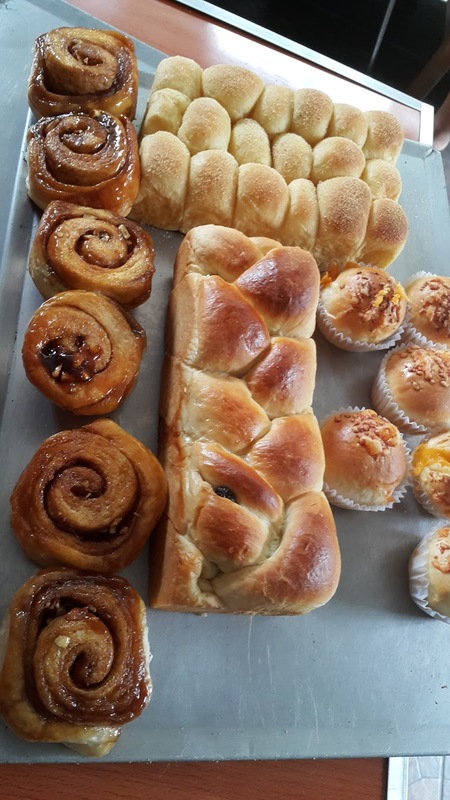 BREAD MAKING IDEAS, PASTRIES AND FOOD Baked Pandesal Hot Off the Oven! Creating a variety of breads using just one dough is not that hard. You just have to think and write them all on a paper and think of whether the kind of bread fits the dough that you have on hand. If you do it right, you can create as many as 12 or even more different kinds of breads from just one dough. 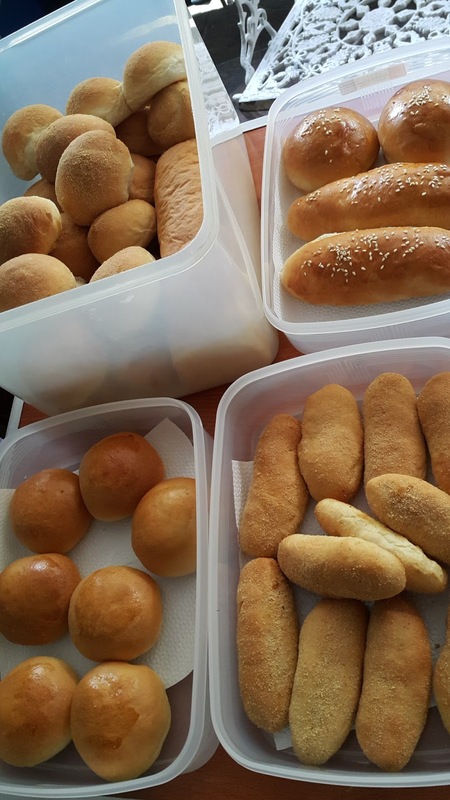 A medium rich dough, one with eggs, milk, butter and sugar can work as you all in one dough and produce for you Pandesal, Buns, Dinner Rolls, Ensaimada, Doughnuts, Mongo, Coconut, Cinnamon Rolls, Loaf Bread, Braided Bread, Fruit and Nut Bread, Sandwich Bread, and many more as shown on the photos below. 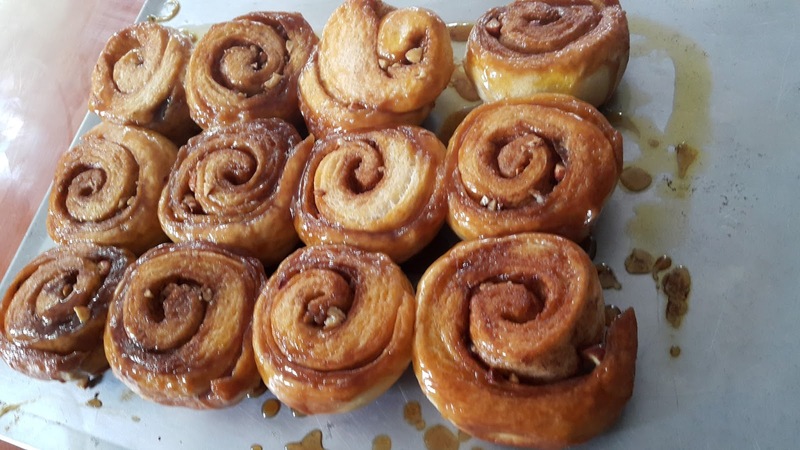 If you want, you can use the same dough to make Spanish breads and Pan de coco, Hotdog and Hamburger Buns etc.,, Now that is real fun in a bun!!! Top photo, one dough showing Cinnamon Rolls, Dinner Rolls, Cheese Rolls and a Fruit and Nut Braided Bread. You can use this dough to make a Loaf bread, Pandesal, Soft bun or hamburger bun and lots more. The only questions is whether you have enough dough to make them so plan ahead and write down what breads you want to make. The same lean dough is used to make Pita Breads, for a Gyro type of sandwich or to make Pita Chips!!! My favorite way to eat Pita is to dip them in Tomato and Basil Salsa since i have tons of Basil plants. 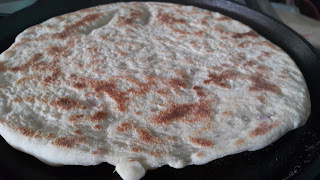 Or you can heat up your cast iron and cook your flatbread Paratha style on the hot griddle or cast iron pan. 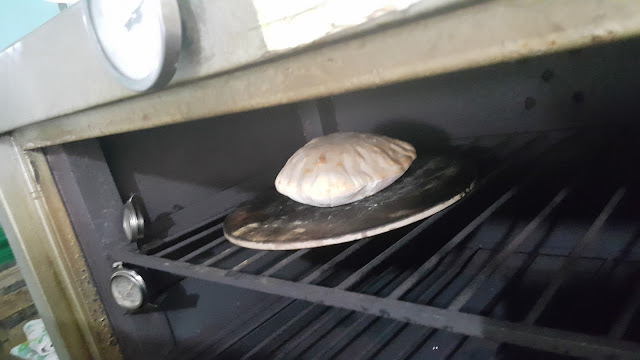 One thing bread making asks of you is to be creative. That's what makes baking challenging and fun at the same time. I can't wait to make another batch of these to eat with hummus and beans, with some of my garden greens. I am getting hungry. I better stop typing. 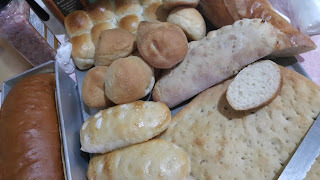 My first experience with yeast baking did not go well at first despite the many baking books i have in my collection( which were all wiped out by the typhoon Ondoy, sept 26, 2009). The most ridiculous thing is that in your attempt to proof the yeast, you actually just snuff the life out of it by using water that is too hot for the yeast to handle. So you throw it out and then try again. Later on, many years after, i found out from my teacher in class that i did not even have to do this, simply use tap water, add a teaspoon of sugar, then the yeast, stir and voila!!! Wait for the dough to bloom or froth and your done. This is if you are using active dry yeast. Instant means you simply dump it in the flour mix, no blooming necessary. Shown here in these images, two types of yeasts, the active dry has to be bloomed first before using, then when the yeast froths, you can dump it into the mixing bowl. ANY LEFTOVER BREADS, DRIED BREADS AS LONG AS THEY HAVE NO MOLDS IN THEM, YOU CAN USE THESE TO MAKE YOUR HOMESTYLE PUDDING. MOIST BUT NOT DENSE, I MAKE THIS FOR MY MOTHER SINCE SHE LIKES SOFT FOODS AND SHE CANNOT CHEW ON THE CRUSTY BREADS AND COOKIES I REGULARLY BAKE. GOOD THING WE HAVE LEFTOVERS!!!! NO NUTS PLEASE!!!! A GOOD PUDDING IS MADE USING A BAIN MARIE, PLACE THE PUDDING PAN ON A LARGER BAKING PAN WITH WATER AT THE BOTTOM. STEAM BAKE FOR 40 MINUTES OR UNTIL GOLDEN BROWN. THE PUDDING PLACED ON A SQUARE DISH, PAT SOME BUTTER OR MARGARINE ON TOP IF YOU LIKE. YOU DO NOT HAVE TO STEAM BAKE RIGHT AWAY, YOU CAN ALLOW THE RAISINS TO SOAK FOR AN HOUR TO SOFTEN THEM. ADDING RAISINS TO THE PUDDING GIVES IT A TWIST... YOU MAY ADD SOME DRIED CRANBERRIES ALSO. ADD SUGAR TO THE MIXTURE OF BREAD, MILK AND EGGS. ADJUST THE SWEETNESS. SHRED LEFTOVER BREADS AND SOAK WITH MILK AND BEATEN EGGS.